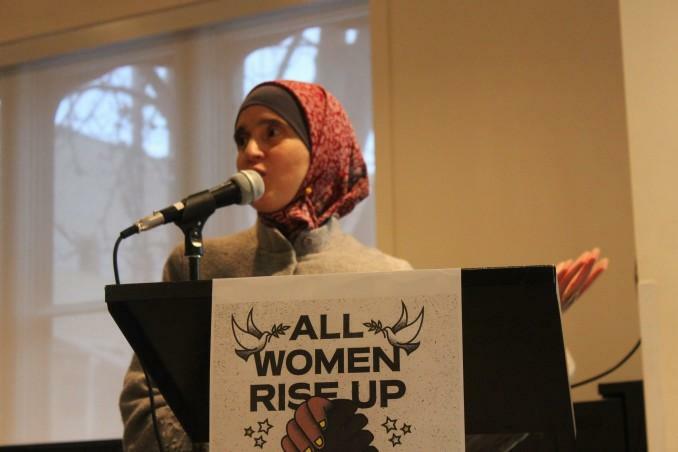 In celebration of International Women’s Day, Continuing Education Students’ Association of Ryerson (CESAR) hosted a discussion with Dr. Monia Mazigh on Thursday night called Women & Islamophobia. Females are one of the most vulnerable groups of people in Canada and Muslim women are especially vulnerable. Mazigh mentioned a 2013 Statistics Canada report, where there was an increase in hate crimes targeting Muslims. Compared to hate crimes targeting other religious groups, crimes targeting Muslim populations were more likely to be violent offences. Mazigh said people are looking for someone to blame and when media outlets show videos of ISIS threats, report on beheadings, or when extremists facilitate mass killings, Muslim people become the easiest targets. Mazigh said Muslim people become the enemy. She said this is especially so for Muslim women who are often portrayed in the media as the supportive wives and mothers of terrorists, or as victims; trapped in a culture that limits their freedom. Mazigh said this is simply not true. In the discussion, she focused on ways Muslim women can work to combat the stereotypes that widely misrepresent their culture and religion. She outlined three necessary steps to create change: becoming informed, taking legal action and reclaiming the narrative. “We can’t tackle a problem if we don’t acknowledge it,” Mazigh said. She said it’s important to be informed, to record hate crimes and instances of discrimination and to try to understand what’s causing people to act this way. Mazigh said that people should ask for their rights. She said people often choose to remain silent since legal battles can be long, stressful and expensive. But asking for support through legal action is one of the only ways to bring about systemic change. Mazigh focused on reclaiming the narrative as the best way to create an informed and accepting society. She said as members of a discriminated group, it’s easy to remain silent but it’s also easier than ever for Muslim women to give themselves a voice and to challenge existing stereotypes. “There are always stories about Muslim women. There are very few stories by Muslim women,” she said.